We have been patient, warm weather has arrived after a long winter. Trees are blooming, and the grass is growing. I love summer its a perfect time to bring out short skirts, flops, rompers and wedges. Along with the cute wardrobe comes golf, beach, pool, and bbq. Pompeii3 is increasing it’s summer gemstone collection to add the pop of color in your wardrobe. Pink is my favorite summer color. After a long day at the office or pool, there is nothing like a summer’s girl’s night out. Pink is hot this year! Mix and match rose gold and white diamonds and morganite gemstone jewelry. This entry was posted in Jewelry Trends and tagged blue sapphire, rose gold, rose gold diamond, rose gold jewelry, sapphire jewelry, summer fashion, summer jewelry trends on May 26, 2013 by blog1039. 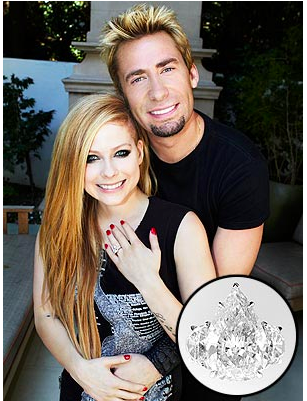 Avril Lavigne is engagement to longtime bf Chad Kroeger from Nickelback. The ring features a 14 carat diamond accented with two shield shape diamonds. A diamond engagement ring of this size an quality is rare! This diamond engagement ring would sell for approx $1.2million. Would you spend this much money on an engagement ring for you loved one? This entry was posted in Celebrity Diamond Engagement Rings and tagged Avril Lavigne diamond, Avril Lavigne engagement ring, celebrity diamond engagement, diamond engagement ring, pear shape diamond ring on May 19, 2013 by blog1039. Many diamond engagement ring trends have come and gone. Vintage to classic tastes and preferences have changed with brides and grooms. Halo diamond engagement rings are hot hot hot this year. The other common theme is affordable diamond engagement rings. This is an affordable diamond halo engagement ring that will make her say I do. This 1.00CT 14K White Gold Diamond engagement ring costs $969 with FREE shipping. The simplicity of the single row of diamonds and ever so popular halo top is something the special someone in your life will always love! Affordable diamond engagement rings is our specialty. The look and quality is same as your local jewelry store but at a fraction of the price. The other popular theme is remounting a family heirloom diamond. This also make the ring a bit more affordable when you use grandma’s diamond. Most older styles are yellow gold, so you can check out one of our new diamond engagement ring settings, or vintage semi mounts to reset your diamond. This allows you to create your own ring and legacy. Whether you and your significant other are creating your own wedding Rings from heirloom jewelry or simply using vintage jewelry or budget shopping for deals, there are many options available. This year’s trend could be your golden opportunity to find affordable diamond wedding Rings. This entry was posted in Bridal Depot, Jewelry Trends on May 14, 2013 by blog1039. Brooke Burns tied the knot with long time boyfriend Gavin O’connor, writer and director. Brooke’s diamond engagement ring features a three carat heart shaped diamond, accented with platinum micro pave set black diamond rings. Her black diamond rings are unconventional but contrast nicely with her diamond engagement ring. This entry was posted in Celebrity Diamond Engagement Rings and tagged Brooke burns, celebrity diamond ring, diamond engagement ring on May 7, 2013 by blog1039. HOT new jewelry trend! 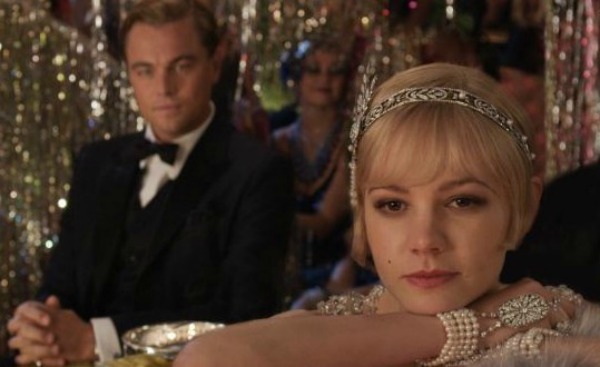 The Great Gatsby is a soon to be released movie that features stunning jewels and costumes. Director Baz Lermon takes a new spin on this 1920′s Scott Fitzgerald novel. I can’t wait for this movie to come out, the trailers look amazing and it will surely be filled with lavish jewels and stunning clothes. Entertaining yes, but I don’t think it will be as good as the 1974 original. Tiffany & Co. on fith ave has a window collection of their art deco heirloom baulble Gatsby pieces. Some where lent to the film production. Our favorite offering is the shimmering diamond and pearl headpiece that Carey Mulligan’s Daisy dons in the Gatsby movie. Sadly, this stunner will set you back $200,000, so we’ll just have to daydream about it, along with Leonardo DiCaprio. Check out some of our vintage diamond pieces for a fraction of the price. This entry was posted in Jewelry Trends and tagged art deco diamond, gatsby jewelry, great gatsby jewelry on May 3, 2013 by blog1039. In London a HUGE 5.30 carat fancy deep-blue genuine cushion cut diamond set a world auction record for price per carat. At $1.8 million / carat this rare diamond sold for approx. $7.3 million. The buyer was Graff Diamonds. The ring was set with brilliant-cut, baguette-cut and pavé diamonds in a “Trombino” ring hand crafted by Bulgari. The ring was made circa 1965 and soared past its pre-sale high estimate of $1.8 million. Diamonds are priced by supply and demand. The depth of color, size, and shape are certainly driving factors for this beauty. However the recent popularity blue diamonds in the market have also helped. It’s no surprise why blue diamonds have made a splash in engagement rings, mens wedding bands, and diamond studs. Check out our large selection of affordable blue diamond jewelry. This entry was posted in Heirloom Pieces and tagged blue diamond, blue diamond auction, blue diamond engagement ring, blue diamond jewelry, blue diamond ring on May 2, 2013 by blog1039.